Solvent filters for chromatography systems. 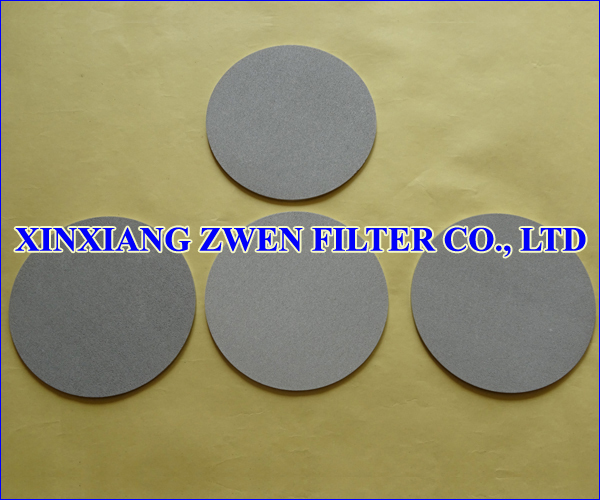 Polymer filters for processing molten plastic materials. Catalyst recovery filters in petrochemical plants and food and beverage applications. Gas filters for chemical processing and semiconductor manufacturing applications. Sensor covers to protect delicate instruments in harsh environments (such as smoke stacks and exhaust pipes). Small fitting-mounted flow restrictors that replace expensive micro valves and orifice devices used in gas leak detectors in the mining industry or in other analytical equipment. Vent plugs that allow internal pressure of systems to come to equilibrium with outer atmospheres such as in space vehicles, automotive (truck and train) brake systems, and instrument cabinets used in harsh environments. Vacuum delay valves in automotive carburetors. Pump priming vents for pharmaceutical micropumps. Gas detectors for mining operations. Oxygen sensor covers in turbine and jet engine inlet cones. Protective covers for electronic process sensors. Addition of CO2 to neutralize acidic waste stream in paper processing. Aeration of sewage effluent to increase biological activity. Addition of air into fermentation processes such as beer brewing or fuel ethanol production. Introducing hydrogen into refinery cracking operations. Increasing the oxygen content in fish farming plants. Adding ozone to a water treatment stream. Introducing nitrogen into food products such as beverages and cooking oils to remove oxygen and extend shelf life. Finish coatings for printing papers. Solvent-based adhesive coating of tapes. Air rollers for handling sensitive films with no direct surface-to-surface contact. Fluidizing cones on silo outlets to aid dry process chemical flow into a reactor. Moving dry goods, such as cereals, through process tubing. Loosening of bulk dry chemicals after transport prior to dumping. Vehicle or train air brakes. Gas-activated process valves in chemical plants. Air and vacuum pump discharge mufflers.